Feels like I have waited for ages to read this book. Once I heard about it I knew I had to read it. Then there was that gorgeous cover too. Sigh. So stunning. I requested this book, and was able to read it early via Netgalley. <3 Which makes me so happy, as I was so excited about it. It was worth the wait. 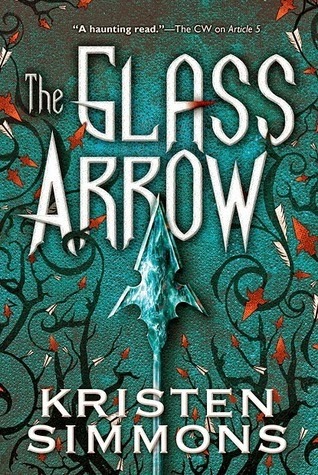 I found The Glass Arrow to be a quick and easy read. Which I loved. Which also means that I enjoyed the writing a lot. I sometimes had a few small issues, but for the most time I adored the writing in this book. I found the story to be exciting and interesting. The characters were pretty awesome too. I've decided to give this book a four star, as I had some small issues with it, but I also really enjoyed this book. It was special. And a bit different. And yeah. I enjoyed it very much. I'm glad I read it. <3 This book is told from the point of view of Aya. Whom I thought was a little bit young, though I didn't mind much at all. I loved how fierce she is. She's strong and she isn't dumb. Okay, she might act a little bit weird at times, but I adored her. I think she was an amazing main character and I loved reading about her. Loved getting to know how she lived in the woods, before being taken. Loved getting to know her family, which she talked about some. It was all pretty interesting. Though there is a lot of thinking going on in this book. The story in this book is all kinds of interesting. More than half the book takes place with Aya locked up, getting ready to be sold at an auction. Which was pretty creepy. Yet I loved reading about it. I enjoyed reading about the place she had to stay at, how the woman who run the place was, how all the girls behaved. I enjoyed reading about the creepy Pips. And, shudders, the Watchers. There were a lot of those. And they are all kinds of creepy. And awful. And do lots of mean things. It was kind of exciting. There are so many characters to read about in this book. And I enjoyed getting to know all of them a little. There is Kiran, whom doesn't talk. I adored getting to read about him, as I found him to be pretty amazing. He is sweet and protective. Though he is not in this book a lot, but that's okay. Then there was Brax, the dog, whom I adored as well. So cute. There is also another girl, Daphne. I'm not sure how I felt about her. She was pretty mean sometimes. But I also felt sorry for her, and I grew to like her a lot. Though I felt like reading this book went fast, there is a lot of things happening at all times. And I loved that. Just wishing more of the time had been spent in the woods. I didn't like reading about the city. About the people with a big scar of an X in their faces. Sniffs. It was sad. Well, the reason for it was sad. How the men are in charge, how the women and girls get sold to other men. How there are auctions for them. It was pretty bad. Yet I loved reading about it. Just wishing there had been a little bit more. The romance. There is not much romance in this book. Which did make me a little bit sad, hmph, but I'm also happy about it, because this book didn't need romance. Though there is some really sweet moments between Aya and Kiran. And I loved reading about them together; how they become friends. And a little bit more at the very end of the book. I felt like the ending could have been a bit longer, as I would love to know more about everything. <3 I'm not done yet. But I was also happy with the ending. I thought The Glass Arrow was a great book. It is exciting and interesting and so much is happening. It's different. Different in a good way. The writing is amazing. The characters are adorable and fun to read about. There is even a cute wolf dog. There is a lot of things to love in this book. And I did love most of it. I do wish there might be a sequel someday, though there doesn't need to be. Okay, fine, in my heart and head I need a little bit more after the ending, hih, but I am also happy with how everything ended. I don't really have anything else to say about this book. Just how much I enjoyed it. Sure, I had a few small issues with it, but that didn't stop me from liking it. Just wishing there had been a little bit more romance. <3 But I'm also glad there wasn't, because there is enough. And the small romance is pretty sweet. I adored reading about Aya and Kiran. I really liked the story in this book. Liked getting to see parts of the city, parts of the auction, parts of the Garden. Some places were creepy. Yet I liked it. I'm so happy you also really liked this one! At first I had thought of giving it a pass, but first Alyssa and then you ended up giving it 5 and 4 stars, so it is a book I must read now! Thank you for your review sweetie! So happy you enjoyed this one, C! I think I'm starting it today. :D I hope I can connect to it as much as you. Sad to hear there isn't that much romance because I had assumed there would be. :( But maybe lowered expectations will be a good thing. Lovely review, and thank you for sharing! Ooh, I'm so glad you liked this! It sounds so good. I can't wait to read it! :) Great review, Carina!! I am actually reading this book at the moment, so I am glad to see you loved it! I can't wait to finish it and review it. It seems like I am in for a good read. I an't wait to read this book! I love that it's a stand-alone and it sounds so good.